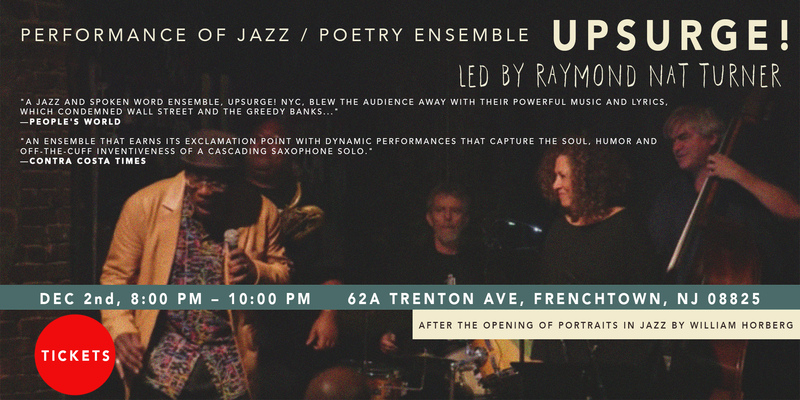 ArtYard is thrilled to announce that the jazz/poetry ensemble Upsurge, led by Raymond Nat Turner, will perform at 8:00 pm on Saturday, Dec 2nd at ArtYard’s theater. This is after the opening of Bill Horberg’s exhibition Portraits In Jazz, at 4:00 pm. Both events are connected through the idea of celebrating jazz as a form of expression. Voted “Best of the East Bay”, the group was founded in 1990. UpSurge is an ensemble of piano, bass, drums, and frontline ‘horns’—saxophone, trombone, and jazz-poets Raymond Nat Turner and Zigi Lowenberg, who bend metaphors and split similes throughout the swinging ride. With imaginative compositions, innovative arrangements and in-your-face consciousness, UpSurge is honing one of the most original group sounds on the music scene today. Their sound is a compelling mix of jazz, poetry, and politics. But UpSurge isn’t afraid to challenge fans or themselves by incorporating other elements such as funk, klezmer, calypso and found sound. UpSurge is the ultimate hybrid. They’re New York, and Los Angeles (co-leaders hail from both coasts). They’re African-American, Jewish-American, and more. They march to a different drummer on the high wire of unpredictability. Their second release, Chromatology, mixes conscious words with assorted grooves and feels, dissolving boundaries that separate genres and people. This isn’t surprising. UpSurge’s diverse influences range from Abbey Lincoln, Sonny Rollins, to Allen Ginsberg, Amiri Baraka, Bertolt Brecht and Langston Hughes. The group’s critically acclaimed debut CD, All Hands on Deck, garnered them an Indie Award nomination by the Association for Independent Music (AFIM) in 2000.